Although Halloween is an American holiday, Koreans and expats all over Seoul party even harder then the American's back home! Of course Itaewon which is an expat heaven was a popular destination. However, all of the video footage above was taken in Hongdae which is home to several universities in Seoul. The young college crowd provides a great atmosphere and there are tons of clubs and restaurants which offer costume contests and drink specials. 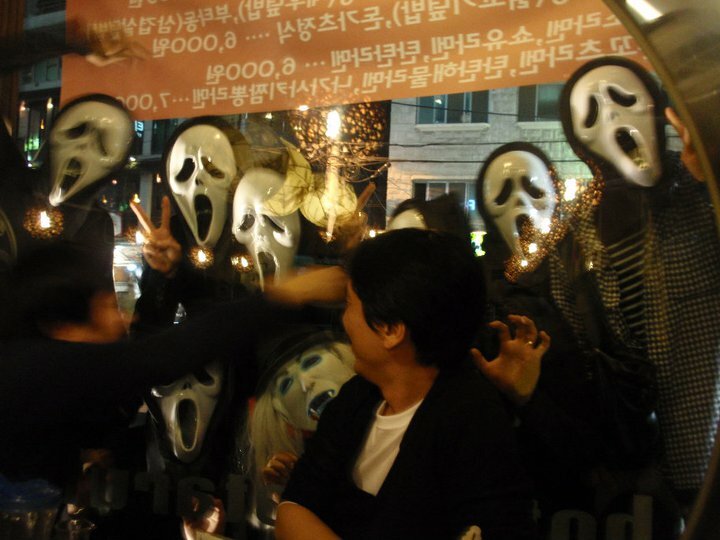 Seoul is clearly the place to be for Halloween as many expats and Koreans travel from throughout Korea to celebrate. 1. Make a costume- Finding Halloween costumes in Korea can be difficult. Get creative and made a costume. 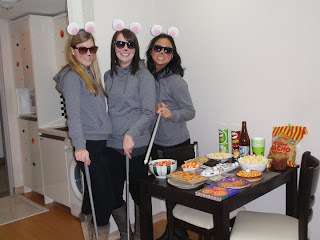 For example you can be the three blind mice. Simply buy 3 of everything: a gray H&M sweatshirt for 20,000, a gray head band 2,000, round make up puffs 2,000, pink paper 1,000, a swiffer mop from Daiso 3,000. Glue the round make up puffs to the head band and attach cut outs of the pink paper for the mouse ears. Twist the handle of the swiffer mop loose and attach red or purple tape to the bottom for a blind person walking cane. 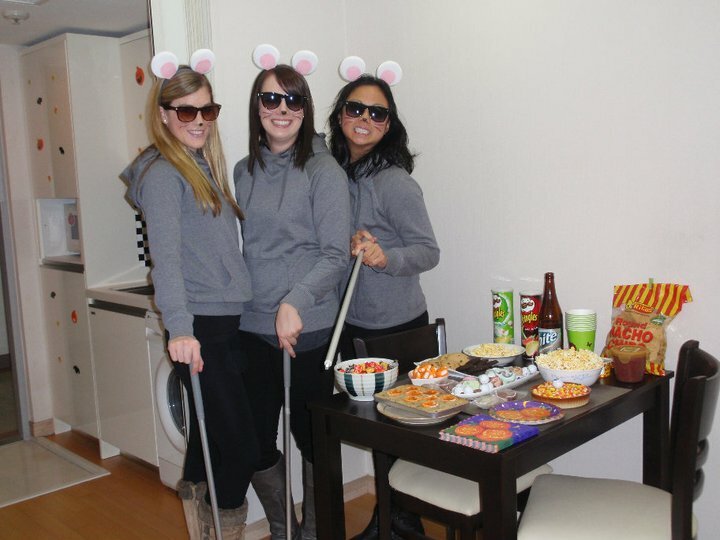 Wear your sweatshirt and dark sunglasses and walk around pretending your a blind mouse! 2. Buy a random costume the day of Halloween- Although costumes are hard to find, there will be tons of stands on Halloween Day selling weird masks, hats, and all sorts of crazy costumes for those that weren't planning on dressing up. This is totally last minute, so expect to pay a bit more for your costumes. A horse head mask will cost around 20,000 to 30,000 the day of Halloween. 3. Ride the Subway- Riding the subway to your destination is one of the best ways to get a close look at some of the crazy costumes; and you will be surprised at how much effort some of the Koreans put into their costumes! Plus, who wouldn't want to see a chicken sitting on the subway, or a Korean guy dressed up as sleeping beauty! 4. Get a window seat- At some point in the night you will need to sit down to recharge that dancing battery. Get a window seat at any restaurant on the main street, this might even be worth waiting for if there aren't any open. People watching from inside the restaurant on Halloween is amazing, you might even get a window full of scream faces like in the video above! If you have any questions or comments about "Halloween in Seoul" please leave them in the comment box below or email goneseoulsearching@gmail.com.